Definition: Something you cannot understand, usually because it is so complicated. It is widely thought that ‘all Greek to me’ derives from the Latin phrase ‘Graecum est, non legitur or Graecum est, non potest legi’. How’s your latin? 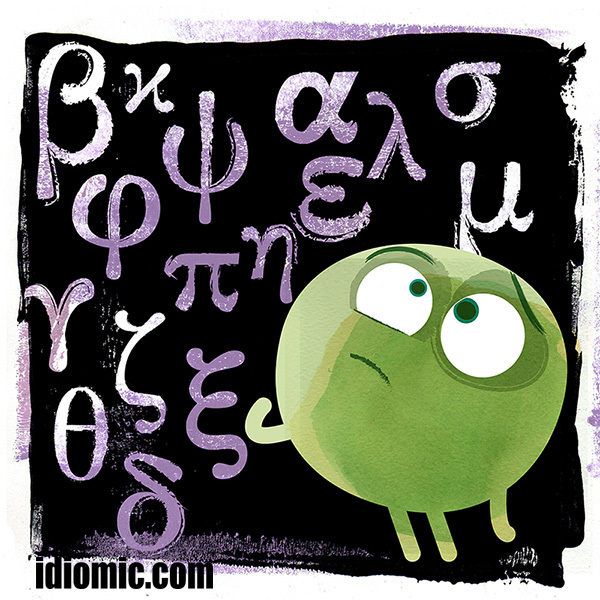 Iddy’s is a bit rusty, but he did eventually translate it: ‘It is Greek; it cannot be read‘. Those Romans. Already dismissive of the civilisations before them! Its modern form began to creep into the English language in the sixteenth century. Similar phrases appear in plays by Dekker and some fellow called William Shakespeare. Italian: To me, this is Arabic. Slovakian: This is a Spanish village to me. Comparing the incomprehensible to the Chinese language is by far the most common. Hungarian, Hebrew, French, Dutch, and Arabic, to name but a few, use variations on ‘Sounds Chinese to me‘. Not to be outdone, English writing is sometimes referred to as ‘chicken intestines‘ in Cantonese.